Today we welcome Karen A. Chase, and her debut memoir "Bonjour 40: A Paris Travel Log." Karen was born in Canada and traveled with her family living in over 40 states and provinces. She started studying advertising art in 1990 when she moved to the United States. In addition to building her own design and branding studio, she started to do freelance writing and has contributed to publications, including Bella Magazine, The Richmond Times Dispatch and HOW Design Magazine Online. She lives in Virginia with her partner Ted and their two cats. If Karen A. 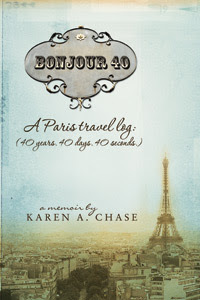 Chase absolutely had to turn 40, she decided she could do it gracefully in Paris… for nearly 40 days. What began as a blog to communicate with friends and family became a travel journal filled with over a months’ worth of daily details of her Paris adventures, each of which could be read in about 40 seconds. Peppered with Karen’s own photographs, she also weaves in longer stories that reflect upon her experiences with Parisians, travel, food, photography, writing, and love in the City of Lights. You can find Karen on Facebook, Twitter and her website. Thanks to BookSparks PR, we have a 5x7' print of one of Karen's photos from her book to share with a lucky reader anywhere in the US. Author of "Bonjour 40: A Paris travel log"
Asking me to pick my favorite family holiday recipe is like asking me to pick my favorite place in Paris. It’s soooo difficult. I’ve thought about this for weeks. I perused my recipe pile and my memories of Christmases past. Eventually, I decided. Whipped shortbread cookies. As with most of my family’s recipes, baking these cookies began the holidays. We gathered in the warm kitchen in the midst of deep Canadian winters and made them together. 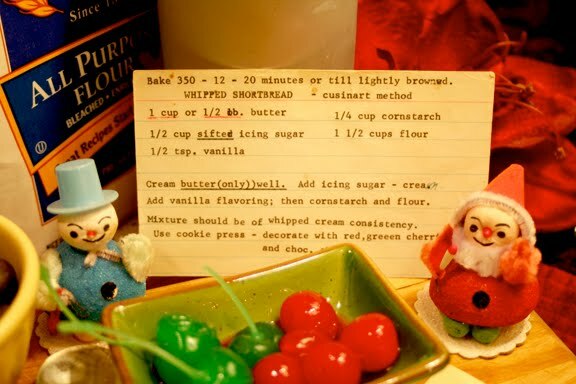 They were prepared a few weeks before Christmas, and placed in old ice cream buckets (with one or two stolen in the process) between layers of wax paper. This week, I made my own batch of whipped shortbread. With my mother’s recipe card and two cookie sheets, I was once again seven years old and with my family at Christmas. How do they taste, you ask? Each cookie placed in the mouth melts into soft, light, buttery air, with the cherry or chocolate lingering on the tongue like the last notes of "Oh Holy Night." How can something so small, a recipe with only five ingredients, do so much? It isn’t the cookies. It’s what happened around them. It is because in our house holidays were filled with joy, we spent time together, and the memory of baking whipped shortbread with my mum is simply part of where my Christmas spirit began. And still begins. The typed recipe card is my mother’s. On the back it says, “Recipe taken from Penny Powers’ Christmas Rec. (blue book),” which was published by the Saskatchewan Power Corporation where my mother used to work. Penny Powers was a pseudonym used by the Saskatchewan Power Corporation to describe its home economist. The little snow-people among my finished cookies were a gift my parents received for their first Christmas together – almost 50 years ago. 1. Please tell us: What is your favorite foreign (international) food? US only. Giveaway ends December 11th at midnight EST. My favorite foreign food is Chinese. Specifically egg rolls and chicken fried rice. It's hard to say, I love food so much! This time of year, though, I'm especially fond of Pho (Vietnamese Beef Noodle Soup). It warms my sould. It's a toss-up between Mexican and Italian food. No really - it's Italian. Yummmm!!!! Is it the herbs, the olive oil, the tomatoes, the cheese? Yes! Italian, any day of the week. My favorite foreign food has to be tacos.